48 MMS November 2017 mmsonline.com SHOP TALK T h e i n a u g u r a l M o d e r n M a c h i n e S h o p To p Shops Conference concluded September 7 in Indianapolis, Indiana. The event program was based on Modern Machine Shop's annual Top Shops benchmarking program and highlighted presentations from several past and present Top Shops honorees. The event was presented in pa r tn e r s hip w i th A M T—T h e A s so c i atio n Fo r Manufacturing Technology. 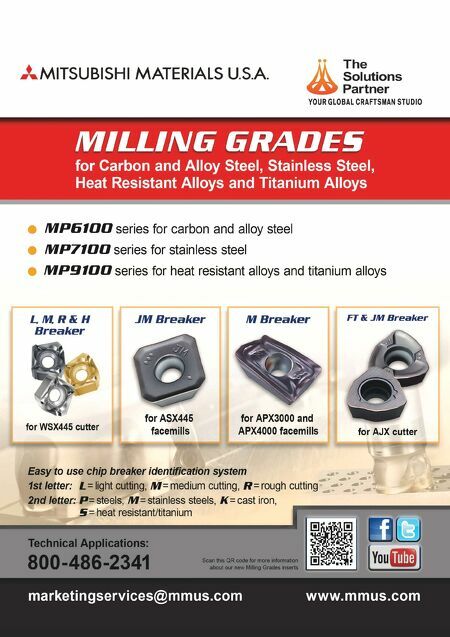 The event drew hundreds of machining profes- sionals from all over North America and across the globe. Managers, executives and engineers represented more than 100 shops that came to share insights, network and get practical, action- able information to take back to their businesses. Many of the seminars and panel discussions were led by previous Top Shops, sharing real-world stories, information and best practices in areas like business strategies, hiring and training, five- axis machining, machine monitoring, automation and more. Other presentations looked ahead to the contours of metalworking's near future, includ- ing the demand to fill jobs, increase shop con- nectivity and adapt to changing conditions. "This event was designed as a conference 'for top shops, by top shops,' and it delivered," says Dave Necessary, event director. "Leading shops came to not only benchmark their current busi- ness, but to find ways to improve them. We couldn't be happier with this year's inaugural event. But we're already discussing ways to improve the event moving forward." The Top Shops Conference also offered an exhibit room, off-site tours, and networking events, including the presentation of the 2017 Top Shops Awards to this year's honorees. Four participating shops in the benchmarking group were named 2017 Honors Program winners for the primar y sur vey categories. This year's w i n n e r s i n c l u d e X L M a c h i n e ( T h re e R i ve r s, Michigan), Richards Industries (Cincinnati, Ohio), Land Sea Air Manufacturing (Westminster, Mary- land) and MRS Machining (Augusta, Wisconsin). 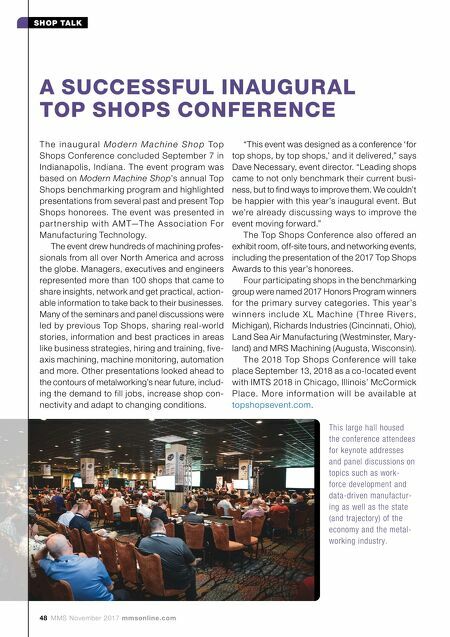 The 2018 Top Shops Conference will take place September 13, 2018 as a co-located event with IMTS 2018 in Chicago, Illinois' McCormick Pl ac e. M o re i nfo r m ati o n w i l l b e ava i l a b l e at topshopsevent.com . A SUCCESSFUL INAUGURAL TOP SHOPS CONFERENCE This large hall housed the conference attendees for keynote addresses and panel discussions on topics such as work- force development and data-driven manufactur- ing as well as the state (and trajectory) of the economy and the metal- working industry.